The Carpet Store and More can supply and install hard wearing durable commercial carpets in Schools, Nursing Homes, Crèches and any other commercial environment. We can provide a great flooring solution for your premises to ensure safety and quality while also keeping within your budget. 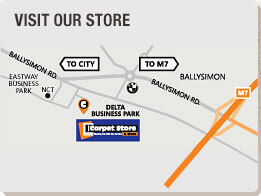 When choosing a commercial carpet, there are many aspects in deciding the type of carpeting to suit your requirements. Durability, maintenance, safety, cleaning and design are some of the reasons to talk to an expert to help you choose the best flooring for your needs.